Dari (Vendari 63) is a half clone from the 22nd Century. She met the 8th Doctor in The Source, an action figure video I made in 1998. When the AFT came along, I saw no reason not to continue with her. Jess (Jessica Reed) is the first fully AFT companion and joined the TARDIS crew in the previous story If Only. An out of work actress from the 21st Century she has a unique future- that she will become her own grandmother, a fate seen to play out in the 8th Doctor finale The Infinty Program. 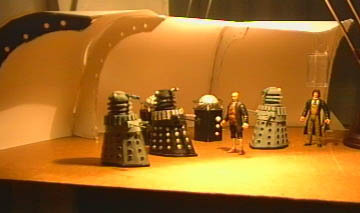 Three Daleks were constructed for the story using a paper template stuck on to card. The skirt balls were made of blobs of PVA glue. The slats include thin metal mesh, the arms are cocktail sticks. The head domes are foamboard, sanded into shape. Inside each of them is a mass of green tissue. Originally shown between July and October 2003. It was re-presented 11 March 2009. The debut of the Daleks on the AFT had been a long time coming. It took a lot of time, planning and effort to make the custom Daleks and they needed to appear in a suitably grand story. 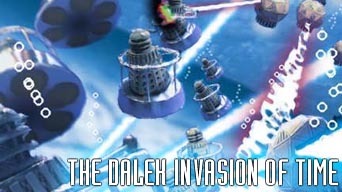 Inspite of coming before the official 40th Anniversary story Type Forty, The Dalek Invasion of Time can also be taken as an Anniversary special with its links to the very first episode An Unearthly Child and the cameos of the third Doctor, Sarah Jane and the Nimon. This story is also significant as it marks the end of the first round of Torchwood stories. Torchwood, the time travelling Victorian gentleman whom the Doctor bumps into from time to time was first introduced in Split Infinity in September 2002, but his story was always leading to this place. The original plan was to have part one air in December 2002. As the Doctor is shot by a Dalek revealing Torchwood's unexpected treachery, he was supposed to say "Merry Christmas Doctor." The need to establish not only Torchwood as an ongoing character but also the 8th Doctor and his companions pushed the story back in the schedules to mid 2003. You can read more about Torchwood's origins here. 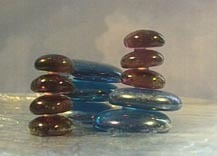 The story was shot in a block along with the previous adventure If Only in early 2003. 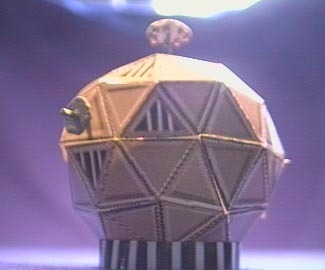 The Daleks' ship is the base of a Zeroid figure from Terrahawks. Jess's massive gun is I believe from a Chewbacca figure. The magna clamp that the Doctor uses on the Black Dalek is based on the Doctor's tool kit created for the 5th Doctor and reused in the TV Movie. The exterior of the city on Helquis was made up of glass beads unfortunately bearing no similarity to the interior which reuses the Naboo set from the Star Wars toy movie Trials of the Force. The storyline went through several streamlining edits. One strand edited at the sthad Jess abandoned in the desert between the advancing Mechanoid and Dalek armies. Not only having to deal with the warring monsters, the Doctor had to save his companion- her plight made more urgent by the fact that her death would endanger the timeline. Even when being edited, the story remained in flux. The final page of the story was pieced together entirely in the editing process when it was felt the original ending was too rushed and abrupt. The device that Torchwood uses to call the Doctor was given to him in The Changing of Bracchis. The scene with Ian and Barbara comes directly from the first ever episode, An Unearthly Child. It's the fourth Doctor that encounters the Nimon in The Horns of Nimon rather than the third Doctor in the altered timeline. The Mechanoids first appear in The Chase and immediately do battle with the Daleks- continuing the conflict in comics but never again on TV. A later story establishes that the year the Daleks are on Helquis is 5151.